Just when you thought the oil spill in the Gulf from the BP well was over, there’s a new oil leak in the Gulf. Actually it’s not a new one. It’s been leaking oil since September 2004 and some sources say if you add up all the estimates of oil leaked into the Gulf over the last 11 years, the spill is the second largest ever in the Gulf. The BP spill is still number 1. The roots of the leak lie in an underwater mudslide triggered by Hurricane Ivan’s waves in September 2004 that toppled the Taylor Energy platform and buried 28 wells under sediment about 10 miles off Louisiana at a depth of 475 feet. In 2008 the Coast Guard determined that the oil leakage posed a significant threat to the environment. In 2013 federal officials estimated the site had been discharging approximately 4,500 gallons per year, or around 12 gallons per day. In April, 2015, confronted with an Associated Press analysis of pollution reports that shows a recent spike in sheen sizes and volumes, the Coast Guard released a new estimate. 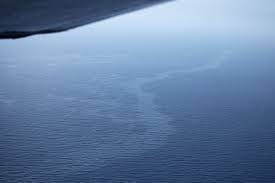 The Coast Guard says sheens containing an average of 84 gallons per day have been spotted at the site since September 2014 for a total volume of approximately 16,000 gallons over the past seven months. After spending tens of millions of dollars to contain and stop the leak, Taylor says nothing can be done to completely halt the chronic oil sheens. Without access to the buried wells, traditional efforts at plugging and capping won’t work. The company says nothing can be done to completely eliminate the persistent sheens coming from the seabed where its wells are buried. Taylor submitted a final resolution to the government, but Taylor and government officials agree that the best course of action is to not take any affirmative action due to the possible environmental risks. The oil is still leaking from the Taylor site.